The WLW Show 27/9/2017 – We Love Woking……The Story so far. No guest this week, so we’re gonna chill & continue Jackie & Tim’s Jedi Training Live on Air! We’ll be looking back at our Mission so far, and spend even more time chatting about what’s been going on & what’s coming up with events and happenings from around the area. As always, there’s so much going on that I can’t fit it all into this post! We have another phone in with Kat from Kelly’s Charity Events about their Cross Country Challenge to raise funds for Challengers, a great charity, which recently had a fire at their play centre. With lots of cool music in between the chat, there really is no better way to spend your Wednesday evening! Join Jackie Witney , Timothy Buckler & myself from 8-10pm, here on Radio Woking. On DAB, search Radio Woking. 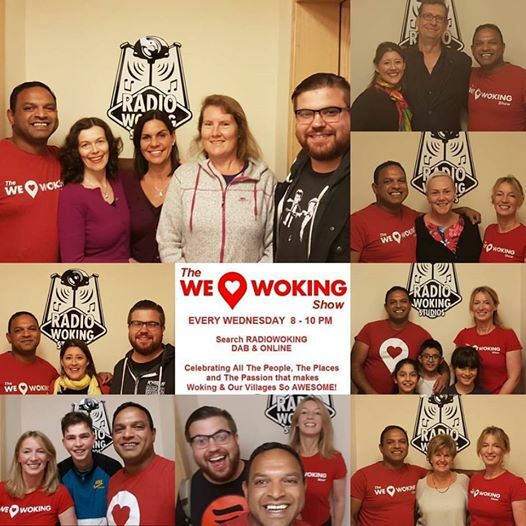 To listen on your mobile or tablet, you can download the free Radio Woking App, or find us on the free TuneIn radio app.